India is one of the most competitive market for the aviation sector. With the number of people choosing this mode is on the rise, this sector will surely help the stock markets. But with so many different airlines in air, it’s a difficult choice to make for the consumer. Cheap Fares, better connectivity, in flight services, on time performance etc. are some of the parameters that are considered while booking a ticket. Even the airlines are pushing hard to get more passengers. From cheap tickets, free meals on-board, extra luggage, twitter friendly customer service etc. they are doing everything possible to get more passengers. But the only Airline which is yet to join this bandwagon is our national carrier – Air India. Just last Saturday, I was flying from Hyderabad to Bangalore by Air India. This was my first time with them, but since this was the first flight in the day to Bangalore, had no option but to choose this. Further, I had heard stories about the bad service of the airline but I guess I wanted to experience it first hand ! Well, it turned out they are still the same :(. Be it the customer care, air craft condition or the cabin crew, they would score miserably against the other LLC today. Starting off with the customer service. I was trying to do a web check-in since Thursday – 48hrs before the departure. And the website wouldn’t allow me to do so. It kept on giving ER2203 error and asked me to contact the agent. I contacted them on Twitter and instead of helping, they told me to contact their toll-free number. Why have a twitter handle in the first place ? Anyways, I contacted the service help line, and I was told that the server is having issues and asked me to try later. And then I realized there was no point in continuing this. If something didn’t work for 48 hrs, I wouldn’t expect it to do wonders now ! Nevertheless, I finally boarded the flight. This Air India flight was coming in from Muscat and was flying to Bangalore via Hyderabad. Once I entered the aircraft and took my seat, the first thing I noticed was a broken book organizer – the place that has the safety manual, magazine (not in this case) behind the seat. Even the seats were bad and looked dirty. Then I looked here and there and noticed a kind-of broken overhead luggage cabin. I was surprised that this is the same flight that is coming from Muscat. I mean what image would Air India be creating in other foreign destinations if this is the condition everywhere ? I’m sure Modiji’s Air India would be a different story all together. But I strongly feel, the government needs to pay a lot more attention of the sorry state of Air India. Lastly the cabin crew. Let me start this by posing a simple question – Why do we need cabin crew ? To serve food and water ? No. Cabin crew is there to help you in case you are in need. The first and foremost thing is that the cabin crew should be approachable, I mean should look approachable. The crew should wear a smile, greet passengers and make them comfortable. 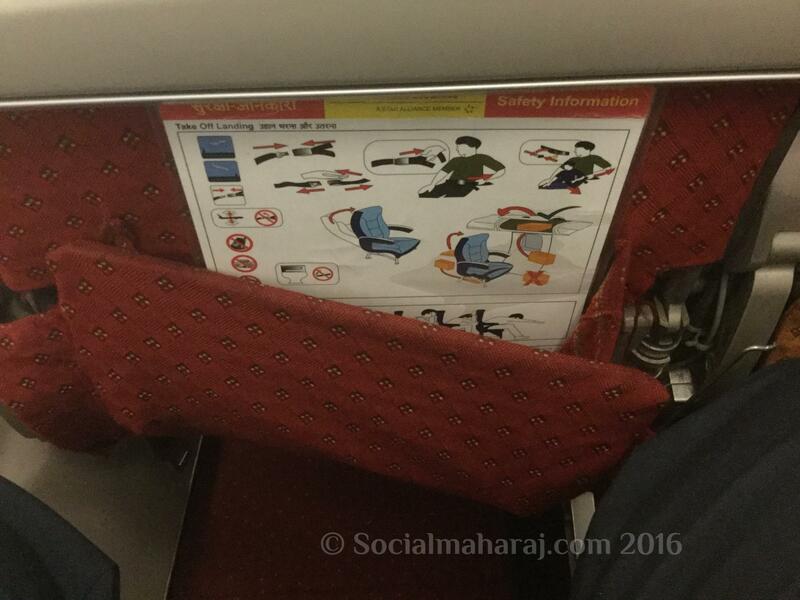 But this wasn’t the case in my first and last air India flight. I was highly disappointed by Air India. Not because of the below average experience I had, but by the sorry image of India’s national carrier abroad. I would strongly urge the officials to pay more attention to the ailing Maharaj and also to the crew and everyone in a customer facing role to be a bit more generous and approachable. Because in the end we aren’t doing a favor by traveling on Air India. A friend also faced the same drama while attempting a web check-in on Friday. Eventually, she decided to reach airport early and do the traditional check in. Really sad. Classic example of a good brand falling prey to mismanagement.